'Chicken Rice' is a must eat street food dish in New York even if you're not a street food fan. 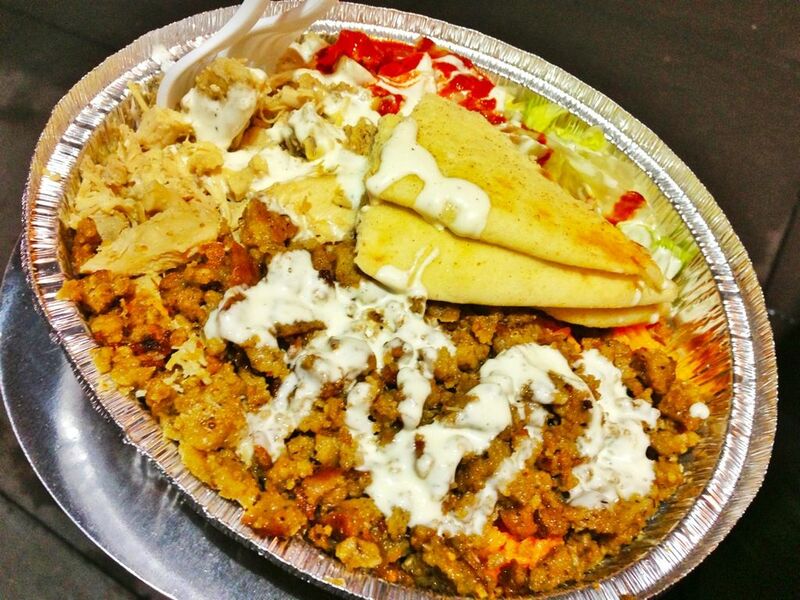 It is known by many names; some call it the ‘Platter’, some know it as ‘Chicken & Rice’ or the ‘Gyro Spot. Whatever it is, i'll gladly ditch my Michelin stars just so that i have space for my favorite 'Chicken Rice' in the city. And the only one you should eat at is The Halal Guys on 53rd and 6th in Mid Town (the original). It's not really chicken rice per se, and certainly not the Hainanese or Singaporean Chicken rice that we are familiar with. 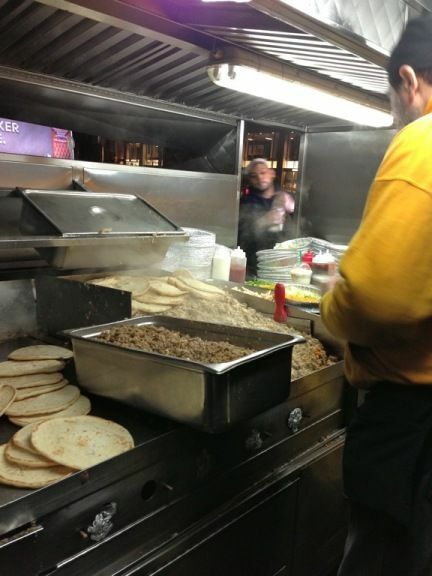 This is the American Halal food cart sort. Check it out for yourself. Now doesn't that look gorgeous? The fluffy long grained Basmati rice can be topped with the plainly seasoned grilled chicken and/or the must have heavily flavored lamb loaf bits. Part of the secret to this delicious meal is in the white sauce which is creamy and really helps in neutralizing the crazy hot sauce that they have. Go easy on the hot sauce, it's FIERCE. The pita and lettuce also help to cool the heat. For $6, you get a huge tray of rice with meat. S and i would usually shared a tray and even so we can never finish it all at once. The convenient packaging makes it easy for us to pack it back as supper. The gyro is much tastier than the chicken, which tends to be a little dry. The picky me can never decide if i only wanna do gyro alone so it's always mixed for us. 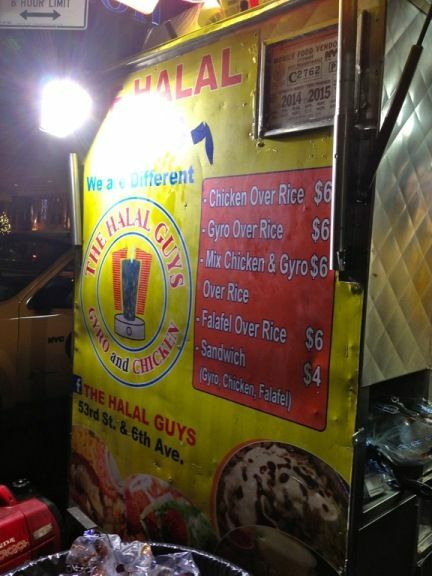 Make sure that you get it from The Halal Guys because there are other food carts that pretend to be them. So here is how you make sure you get the right one. 1. The Halal Guys currently brand their bags, shirts, and carts with the slogan "We Are Different." 2. Their to-go bags are yellow 3. Their logo features a gyro log on a spit (as shown above). Check out the video to see for yourself how popular The Halal Guys are. Trust me when i say this is THE STREET FOOD of New York City. Eat it like the locals do here. It's just next to Hilton in Mid Town and they now have a few carts all in the same area. I think it's called "Chicken over rice." And you're good, you picked a very famous stall. I tried it before and it was a tad too sour for my taste. I prefer the one outside Elmhurst Station, outside the Target mall, where I used to live. That one was awesome, very creamy. Oh, and they call it "hot sauce" (tabasco), and "white sauce" for mayo. Haha yes! It has many names but I call it chicken rice. :P I think the hot sauce is more than just Tabasco though. Way spicier but love!! Wow! I love the Halal Guys. I always keep coming by every time. The foods are really great and very affordable too.